“Agua! Agua, por favor. Para mi bebé,” the young mother boarding the bus pleaded, catching my arm. Not knowing if I would have time, I sprinted across the bus terminal to the vending machines. My friend Jasminne explained that this woman had been unable to obtain water for her infant because she did not have the right bills. Having traveled internationally, I knew well the struggle of figuring out how to use unfamiliar currency. Hurriedly, we dug through our pockets and wallets. “I have it. I have it,” I exclaimed as I slid two crumpled one dollar bills into the hungry mouth of the Aquafina machine. “What button do I push?,” I asked Jasminne in a panic. “Any button! The whole machine is water,” she responded. Grabbing the bottle that dropped smoothly down the slot, I rushed back across the terminal, and thrust the water into the woman’s hand just before the bus doors slid closed. Our eyes met. My lips formed the words, “Vaya con Dios.” Her lips formed the word, “Gracias,” but it was the eyes that said it all. It is always the eyes that say the most. Whether I spend two minutes, or twelve hours with a family, it is always that last glance that says the most. Gratitude and sorrow and fear and courage. At the close of a day filled with last glances, I shut my eyes and they are all I can see. Those moments imprinted on my memory; those moments when we say everything that the language barrier and our own guardedness has inhibited. When I get a call like that, a few things go through my mind. First, I know that a couple hours ago children, and likely their mothers as well, were released from a nearby detention center in Texas and sent to stay somewhere until their trial and – more than likely – their deportation. Second, I know that they are exhausted, hungry, and just as confused as I would be trying to navigate a public transportation system in a language I do not know. Third, I know that they have a long journey ahead of them and it may be a few days, or longer, before they can get a good night’s sleep. Fourth, I know that they have likely already experienced trauma, possibly even before their arrest and detention; and all measures must be taken to make them feel safe, loved, and respected. The psychological reality for children who are two years old and four years old is chilling. Even more alarming is the messages being received by the eight year olds, and the twelve year olds, and the fourteen year olds, some of whom have grown up in school in the United States and now are being told they cannot stay. Now they are being told we do not want them. Now they are being told they are not a part of the family after all. In Guatemala, I spent time with some of those who have returned. While they focused on empowering those around them and celebrating their culture, some still carried with them scars inflicted by the nation of my birth: scars similar to a child whose parent refuses to claim them as their own. They loved us, and we cast them out as if we did not know them. So when the call comes in, I go. I drop everything, and I go. I spread the word to those in my network that we have family in town, and we do not have much time to make them feel welcome. We might have two minutes to sprint for water before the next bus leaves. Or we might have twelve hours to collect supplies for the journey and share meals and laughter and stories. Thank God for Jasminne, who came over and with her profound fluency was able to understand that the woman was worried because her cousin would only let her stay for three days when she arrived; after that time she did not know where she and her daughter would stay. Thank God for Jordan, who lived in the city she was traveling to and answered his phone immediately. “Pastor Hannah!,” my former church member and current colleague exclaimed. I hurriedly explained the situation and left it in his relentlessly compassionate hands, as I turned my attention back to the other eight mothers traveling that day. I am rarely that fortunate; often I do not get an answer soon enough, and I do not have the luxury of time. That day, however, Jordan did answer the phone and did have the ability to help. So, as I slipped that bottle of water into her seat mate’s hand, she slipped her name and her cousin’s phone number into mine. I would spend the next couple days praying that that information, along with the picture I had taken of her on my phone, would be enough for Jordan to find her when she arrived on the other side of the country. The bus departures continued throughout the day, more leaving every couple hours. We organized triage so that we could deal with the needs of families case by case: focusing on the needs of those leaving the soonest first, and working our way to the midnight departure of the final group. Contacts from throughout Houston came in shifts as they were available throughout the day, bringing what they could. Comfort food from a Honduran restaurant arrived first in the hands of Jasminne. 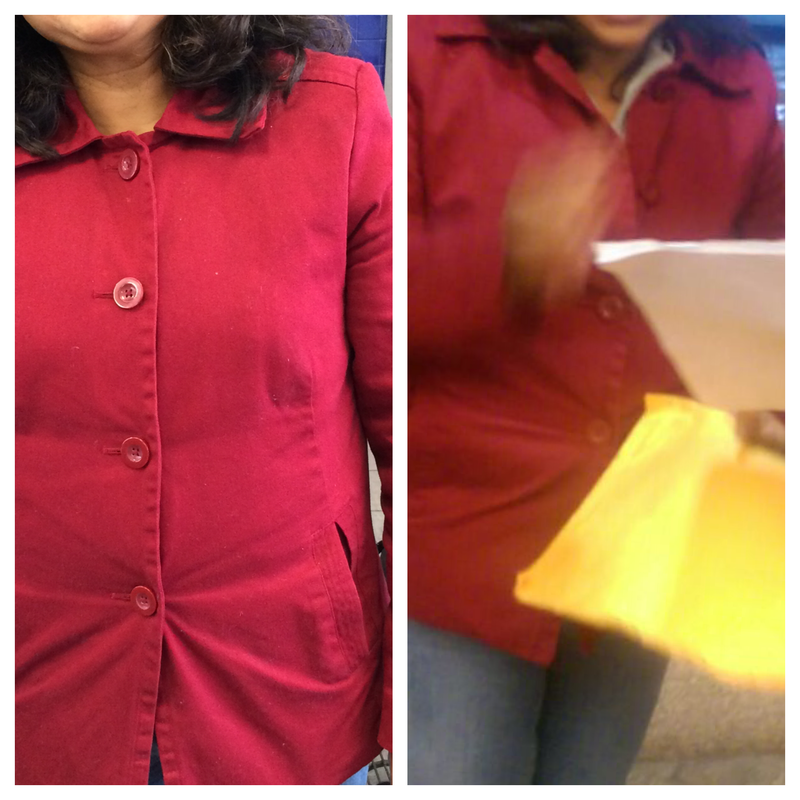 Then a coat in the hands of Marianella. Clothes in the hands of Lupe. Hats and gloves for the snowstorm they were driving into from the hands of Brandi. New clothes for the mother whose clothes did not fit in the hands of Jenny. Resources in the hands of Mia. And one final late night delivery by Elaine to meet the requests of the midnight departure. As I rushed about, I was pulled to the side by a gruff, Texan man with a baseball cap and boots. “I see you are helping these mothers,” he said. “The thing is, I lost my own wife to a brain aneurysm earlier this year, and it would sure make me feel good to be a part of helping.” With that he slipped a twenty dollar bill into my hand, and I slipped it into the hand of a nursing mother. I drove across the street to get cheeseburgers for the group, and as I pulled up to the window to pay, the cashier told me that the woman in line ahead of me had already paid my bill. I made eye contact with her in her rear view mirror and mouthed a “Thank you” to accompany that last glance. Back at the bus station, there was one pair of eyes that remained downcast throughout the day. Probably about fifteen, he was the oldest minor present, and he seemed to feel the weight of it, and the weight of caring for his younger brother and sisters. As this family climbed on the bus in the late afternoon, I called out softly, “Vaya con Dios,” and the young man’s head whipped around. He made eye contact with me for the first time and the last time; and “Thank you!” were his first and last words to me as he finally raised his head erect and his mother’s eyes welled with tears. There it was. The last glance. Varied in intensity, but still the same every time. A glance of gratitude mixed with sadness. A dropping of the guard carefully maintained. In that last moment, getting on the bus unhindered and realizing they can trust us; while at the same time realizing they are walking away. Safety found in the moment it ends. Heart wrenching. In that last glance, they release all they’ve been holding back. Tears well in their eyes. Mouths say words I do not always understand. I do not know what will happen to them, and it breaks my heart every time. I wonder what they see in our eyes. I hope they see love. I hope they see respect. I hope they see that my eyes reflect the pain in theirs, and commit to carry a little bit of it with me. I hope that solidarity makes their own burden just a little bit lighter. Two days later, my phone buzzed. It was a text from Jordan. “We found her! !” Jordan had arranged for housing, clothes and support for the woman who did not know where she would live in three days; he had found her at the bus station. For the first time, the last glance would not be the final word.